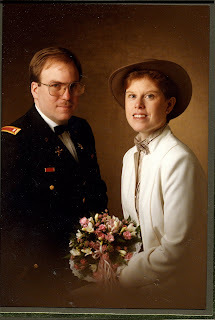 Curtis and I are celebrating 24years today. Plan to go out for dinner. Curtis and I were out early shopping the after Christmas sales. Got some cool stuff half price. We woke up to a new foot of snow on the ground. Very pretty and thankfully the roads aren't too bad. Cait is suffering from a flu bug that I hope the rest of us can avoid. A very Merry Christmas, to all!!! The weather bug is saying 33F this morning, which is the warmest it has been in a couple of weeks. Looking forward to spending the day with my little family. Take lots of photos. For anyone that does follow my blog, wishing you all a very Merry Christmas, as that is what we celebrate in the Barrow household. I think everything is pretty much ready. Have buns in the oven for tomorrow's breakfast. We have a white Christmas this year, which is so pretty. Have the grandkids tonight as mum and dad are working. Harlee will get initiated to our tradition of tomato soup and Lefse. A few photos from yesterday--Harlee had her first haircut at the beauty salon. Candy canes work as a good distraction. Cait finally made it back to Shelby on the train last night At 1am in the morning---only 13 1/2 hours late. Welcome back to MT with the temperature at -22F last night. I feel better now she is home and she loved her train ride--that is a good thing. Also some cool shadows in our back yard yesterday afternoon. Took Harlee and Nicholas to get their pictures with Santa. It was a great time to go--the kids weren't out of school yet, so there were no others in line. 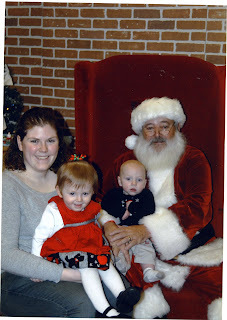 Harlee wouldn't sit on Santa's lap, but would sit on her mother's lap and Nicholas sat with Santa. Caitlin is in Tacoma waiting for the train, to start her adventure home. Can hardly wait to see her and give her a big hug. Had another day of making cookies. Fighting a bug---hack, hack, hack!! The grandkids were here to play again. Today Kirsten and I started making Christmas cookies. It becomes an involved process with 2 little ones around. But Harlee enjoyed tasting the cookie dough--yum, yum, yum. And Nicholas was having fun playing peek a boo with the blanket. My coffee maker wouldn't work this morning and when I came up from my bath there was a new one on the counter. It is very fancy with a grinder combined--WOW!!! Thank you, Curtis. It is snowing and blowing and drifting out. 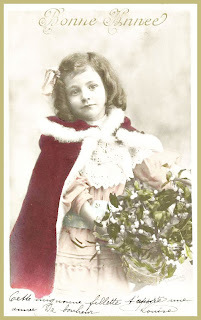 I will be hibernating and trying to finish up addressing the Christmas cards. Had Harlee and Nicholas the last 2 evenings. Harlee enjoying popcorn and Nicholas, just being Nick. at the Barrow household. Harlee is enthralled with it all. Enjoying all the lights. So pretty and the season passes so very quickly. Enjoy!!! Work today and tomorrow. Trying to get packages ready to send and maybe get the cards started too.